Bring this Zakitane portable camera lens with you, you can see the wonderful and marvelous world, capturing the tiny details and recording every important moments of your daily life, anyone can be a professional photographer. Unique Design: Aluminum alloy shell and outer matte painting workmanship, lightweight and portable, deliver bright color and high-end texture, Zakitane camera lens will be so beautiful when matching with your phone. 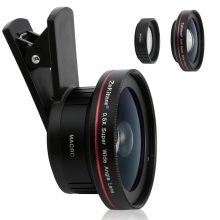 0.5X Super Wide Lens: Capture wider view than the normal camera, shoot amazing photos of people, landscapes and animals etc, perfect for portrait photography and travel. 15X Macro Lens: Make your phone to be a magnifier, shoot every intricacies and details in a very short distance. High-quality: Adopts optical glass and multi-layer optical coating, durable and solid, give clear photos, and with soft rubber pads, never scratch your phone. Easy Installation: Convenient clip-on design, easy to install and take down. 1. When use a macro lens for photographing details, you need to get close to the subject.